Katherine Zeta Jones - Any hand marks for Bipolar Disorder? Poor Katherine having been diagnosed with Bi Polar I recently, what characteristics would you expect to find on her hand? does anyone have a picture of her hand? Re: Katherine Zeta Jones - Any hand marks for Bipolar Disorder? in her left hand we notice a "Persephone" head line that means dark imaginations and a leaning to melancholia. On the left the Jupiter finger is a little bit short/crooked what means a problem with the self-esteem and a sign for missing dad while she was young. All in all usually a sign for a hard youth. the way out was the strong, forceful thumb. If we look for the present Transits to her birth chart, we mention a very restricting Saturn Transit over her Libra collection simultaniously with a Pluto (T) quad. to that. there is now a strong tension between a restricting situation, have to make fundamental, personal changes and a strong drive to set herself free from it. think it's a partly mood with the demand for radical changes on the field of the creative self expression and more. May be at this time she's suffering on similar, wellknown feelings than when she was young: the fear for loosing dad or here the husband. My advice would be: Don't visit only psycholigists because a good psychologically astrologist could descripe the inner situation much better and could give you at the same time better time perspectives ahead. I've just read, that she went very young to London - with 15 - to be trained as an actor. Here she left her home and probably missed his dad. - Sometimes short/bent Jupiter fingers show problems with the lung or here with C.Z. Jones with her respiratiory tracts, as I read about her problems in her early years. Martijn, Catherine Zita Jones is British, not American. Welsh to be precise, from Mumbles, near Swansea in Wales. once, when I was a student I went with a friend by motor scooter around Devon, Conwall and South Whales up to St. David's Head where we camped on a cow meadow. Other nights we stood at a very nice youth hostel near Swansea direct behind the sea coast. It was in a lovely old cottage. Do you know something about Katherine Zeta Jones' mother? hi Manfred, I don't know anything about her mother except she is of Irish or Irish/Welsh descent, Catholic. I read that Catherine phones her mother every day, that they are a close family, she bought her parents a house. But these are only things I've read, I don't know for sure. Thank you for all the photos etc. I have been to the mumbles today coincidently :-) perfect for bike rides, and especially when the weather is as good as its been over the last couple of weeks. We also visit St Davids regularly too.......She certainly does have a close relationship with her parents and obviously strong welsh roots. With all the stress over the last year, with Micheal's illness and her sons autistic tendencies, it has certainly taken its toll. Much love and support would be needed from her family. Lets hope things work out well for her hey? I know this will be off topic, but your comment about Catherine's left Jupiter finger being related to "a problem with the self-esteem and a sign for missing dad while she was young" made me wonder if this would be the same if it was the RIGHT Jupiter finger? I'm asking because I've recently come across two men who had very short right Jupiter fingers. For both the right is significantly shorter than the left (by 9mm, and that on generally short fingers). So whereas the left hands look nearly "normal", their right hands look very unbalanced with Jupiter about the same size as Mercury. Would you relate this to a "missing dad"? short Jupiter in the right hand is even much more significant as a "father deficite syndrom" - here I agree with Arnold Holtzman. In the right it has a bigger effect for the outcoming of the deficite of the self-esteem and it also has effects on the career. Another possibility is that the Ring finger is mostly longer (mention the relation to the Saturn finger, too). Here we have the active sportsman and team player. > Look for B.Obama. - This is one of the favorite themes of Martijn . The short Mercury, too, will show all in all imbalance. that was very helpful! I haven't been able to get my hands on Holtzman's book yet, still hoping for it to become available again some day. However, your emphasis on "here I agree with Holtzman" makes me wonder if you wouldn't generally recommend his work? What you say about the effect on career is very interesting, as both men are social workers, having dedicated their lives to others. As you recommend, I did consider the relation with Apollo/ Saturn, but have come to the conclusion that it's just the right Jupiters which are short. Their left hands have both Apollo and Jupiter reaching about halfway up the distal phalange of Saturn (with Jupiter shorter than Apollo by only about 1mm, i.e. normal) - whereas their right hands have only Apollo reaching halfway up Saturn, and Jupiter barely making it to the crease. Mercury is actually quite long and strong for both of them. I'm still wondering how to talk about this with them, as I think it also affects their ability to form relationships - one is single still at 45, the other in a toxic relationship he hasn't got the strength to break out of. If you have any other info you could share on Holtzman's "father deficit syndrome", I would really appreciate it. ......I'm still wondering how to talk about this with them, as I think it also affects their ability to form relationships - one is single still at 45, the other in a toxic relationship he hasn't got the strength to break out of. If you have any other info you could share on Holtzman's "father deficit syndrome", I would really appreciate it. >> No, not in genereal. I have a adjusted judgement about the books of Holtzman...and reject his comments about Obama. - I would await that the father was completely lost during youth and it was very hard for them because they hadn't really an exampose how to manage or struggle the world in a possitive way. 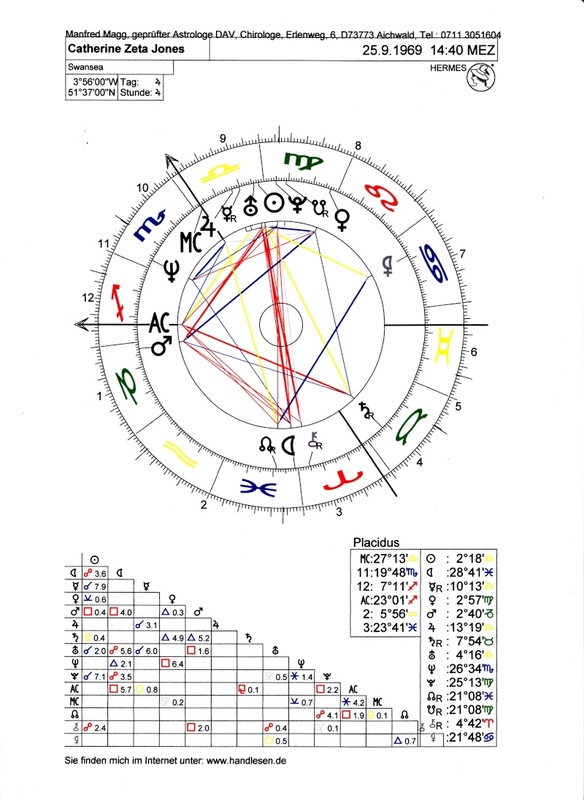 They made their problem to the profession and it would be very interesting to study their birth chart, specially the place of Chiron, showing more detaels about their early hurt. - Long Apollon fingers are signalizing always a very remarcable empathy (that's my interpretation), therefore they need a lot of positive feedback. - To avoid partnership: It's a trick of the Self don't to be hurt again. - Don't leaving toxic partnership: It's easy to get in a dependent partnership for a long Apollon. - One expression and overcome their problem could be to start an "improve your self-esteem" programm in their social work. >> I've scanned the pages about the FDS for you. Please would you send me your email address as pm? Catherine Zeta Jones, * 25.9.1969, 2:40 pm, Swansea/WL. 1969 was all the year BST in use in GB. Therefore we can use 2:40 pm MEZ or CET. I don't find the "Persephone" head line in any of my books and am hoping you might be able to describe it for me please. I can't see it too clearly in the photos. It's a name Richard Unger use and it stands for a head line that goes deeper in the Mount of Moon (unconciousness). Thanks very much. I appreciate the information! ... Not sure yet, but I think I see in both hands a 'Sydney line' (and I think in both hands the headline does not reach out to the lower half of the mount of moon - if so, then we should not call it a 'Persephone headline'). I guess we need better photos before we can make a permanent assessment of the endpoint of her headline. PS. Regarding 'bipolar disorder' I have reasons to associate it with the combination of: short fingers, combined with a longer pinky, ring finger & index finger. I agree with you that we need better fotos to be really shure. It's mostly the same with fotos, that we can't absolute be shure. I think the thumb is remarcable, too, and have some influence - dam the forces sometimes. I agree with you that we need better fotos to be really shure. It's mostly the same we fotos, that we can't absolute be shure. I think the thumb is remarcable, too, and have some influence - dam the forces sometimes. I was just noticing that her right thumb is 'borderline' clubbed. The longer manicured nail hides it somewhat, but it is shorter in appearance than the left thumb nail. in some old books it's also a sign for a disposition for Parkinson's disease. - I've found it sorrily confirmed on a finger of a friend, but I don't know any statistics or more cases about it, Marijn.